HI, I'm 43 and have been with lost hair for a long time in many years. I've tried shampoos but don't work. I also have some stress in me. I'm trying to use Scalp Med do you think that works.? how can I get my hair back? 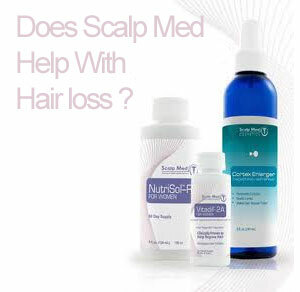 As far as I know, Scalp Med helps to stop the hair loss but has shown so little effect (almost none) in regrowth of lost hair. Scalp Med could be an option in early stage to stop the hair loss, but if you looking for a product that can help to get your hair back, then I recommend looking for products with active ingredient Minoxidil. If you want reliable working solution then Rogaine 3% is the best choice. There is another product called "Provillus" (a new product in market that many saying it does wonder!). I mention this, because sooner or later you will hear about this while searching the Internet - The only reason this product have some positive effect is because the topical formulation contain the drug Minoxidil. You can read a review about provillus here. There are many products that guarantee hair loss, but the truth is that there are only two medical treatment that can really deal with hair loss and approved by FDA. And they are Minoxidil and Propecia. Many companies repackage the Minoxidil and blend it with couple of other herbal supplements and sell it with a new name. And I think its fine as long as it been approved by FDA as a reliable hair loss treatment. This product is just using Generic Minoxidil formula plus other herbs and minerals. They are overpricing this item and honestly there are better and cheaper alternatives to treat hair loss than using this product. Further to if you have noticed that I have bold several ingredients below. Parabens and DMDM are potential carcinogens..therefore it’s best to avoid these ingredients in shampoos. This product is definitely not worth the trouble. I would recommend Rogaine and Vitamin B Complex instead. Inactive Ingredient: Alcohol 60%, Propylene 20%, Purified water. PEG-12 Dimethicone, Propylene Glycol, Diazolidinyl Urea, Methylparaben, Fragrance. Provillus is a 3rd party medication that contains Minoxidil. It does help regrowing hair but the problem is it’s overhyped and over promoted. When they promise that they will do wonders for your hair, it’s actually a completely flat lie. It helps with hair growth but not that effectively. Maybe you should use Rogaine 2% formula for woman instead. It’s the pioneer for Genetic Minoxidil and also recommended by dermatologists and doctors. ScalpMed is a lesser known clone of Provillus and the likes, natural hair loss treatments that use minoxidil, an FDA approved drug for promoting hair growth in their topical application mixed with herbal extracts assumed to inhibit formation of dihydrotestosterone, the main cause of hereditary baldness. Nobody can tell you with absolute certainly whether these products really work. Some consumers will swear they do but they seem to be ineffective to the majority of hair loss sufferers. That means no more effective than plain generic minoxidil, which can be bought for a fraction of the price of ScalpMed or Provillus. The marketing and promotion of such products are overreaching and since they are sold as cosmetics (not as medicinal drugs) they are less well regulated than pharmaceuticals. Hence, do not believe everything their marketers are telling you about their proven results. Consumer reviews of such products are difficult to find whereas sponsored reviews are usually plentiful. This here seems to be a rarely fair assessment of ScalpMed's effectiveness. But since nobody really knows what a good hair loss treatment is capable of delivering there is no benchmark. In general, as mentioned in previous posts, only two products have been approved by FDA for treating hair loss so far (minoxidil that is also included n ScalpMed and finasteride, better known as Propecia) and these two drugs are supposed to slow down hair loss in more than 50% of men. Some people have even experienced regrowth while using them together. But it does not necessarily mean they will work for you as well. Hence, to conclude I believe that there might be some people who have no complaints about ScalpMed but more often than that people buy this product, use it for a few months, finish their stock without noticing any improvement and buy no more.